This work is inspired by D.R. 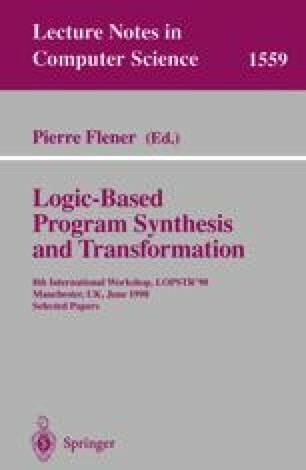 Smith’s research on synthesising global search (GS) programs (in the Refine language) from first-order logic specifications (also in Refine) [8,9,10]. We concentrate on synthesising constraint logic programs (CLP)  instead. We thus only have to synthesise code that (incrementally) poses the constraints, because the actual constraint propagation and pruning are performed by the CLP system. We here only tackle the family of decision assignment problems; the families of optimisation assignment problems, decision permutation problems, and optimisation permutation problems are covered in . A full version of this extended abstract is published as .